If you are looking for a portable chair, one that you can take on a hike as well as camping anywhere, then the Helinox Chair One is for you. It fits in a backpack, making a day walk now have comfortable rest stops! Camping, where your car may be overloaded a little, this chair will take up significantly less room in your vehicle, which is always important. We purchased one chair. We were so impressed by the quality and its ease of assembly and putting away, we got ourselves one more! The beauty of this chair is that when packed up in its bag, it's about the size of loaf of bread. The Helinox Chair One comes in 2 pieces. The mesh seat and the legs/supports, all in 1 neat bag. The aluminum poles (which comprise the legs and back supports are made of the same technology as tent poles) and click together very quickly, locking into place. If you have put up backpacking tents, then the concept behind these poles will be fairly basic - the poles basically slip into place. The mesh seating then slides over the poles, and there you have it - a chair that doesn't look like will hold much weight, but is incredibly sturdy. The setting up of the chair may sound more complicated than it actually is. Once you have done it once, then you will never have any problems again. Pulling it all apart is even faster and more simple. The aluminum poles all fold up, tidily in 1 attached bundle. Who is this chair designed for? 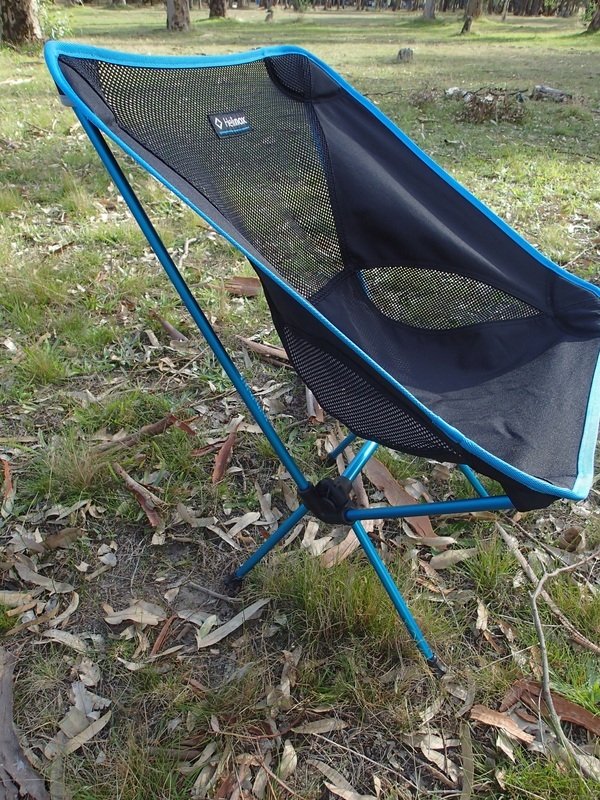 Whilst we have used it for camping and day treks, this chair will suit anyone who enjoys the outdoors. 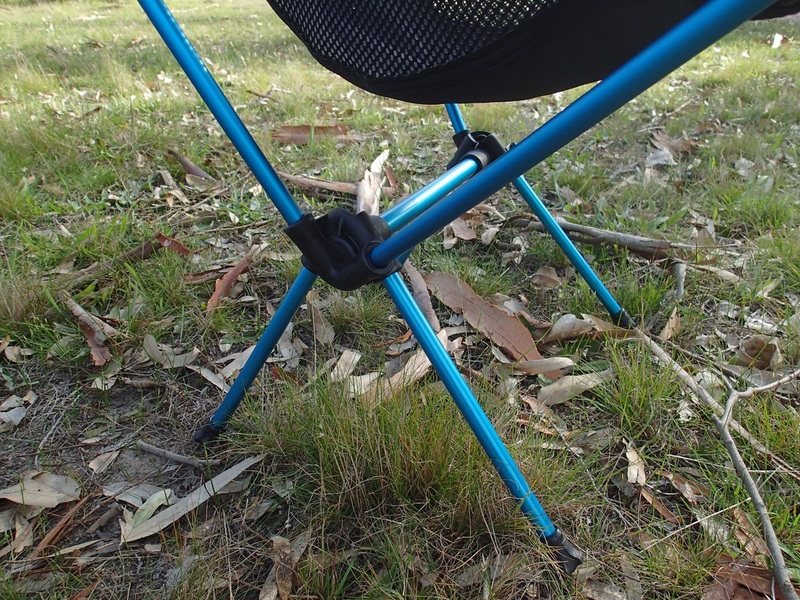 Bushwalkers will not have to sit on the ground when resting (no more sore and cold bottoms). You can sit down and have full back support (much appreciated after carrying a backpack for hours). We have taken it to street parades in the city (carried on our bikes). When you do bring it out on hikes - you will be the envy of all those people sitting on the cold, wet ground. If you stand up at any point, your chair will soon be occupied by someone else. Competition from those who don't own this chair can be fierce. For some, the cost may seem a little high for sitting around a campfire, but if you plan to use the chair in other situations, especially those when you have to carry it, then this is where this chair is best utilised. If you never have to carry a chair further than the boot of your car/trailer/caravan, then this might not be the chair for you. Excellent purchase for people who want lightweight and a space saving chair.